Though Jupiter's red spot looks small in this photo, it's actually about 10,000 miles wide — bigger than Earth's diameter. 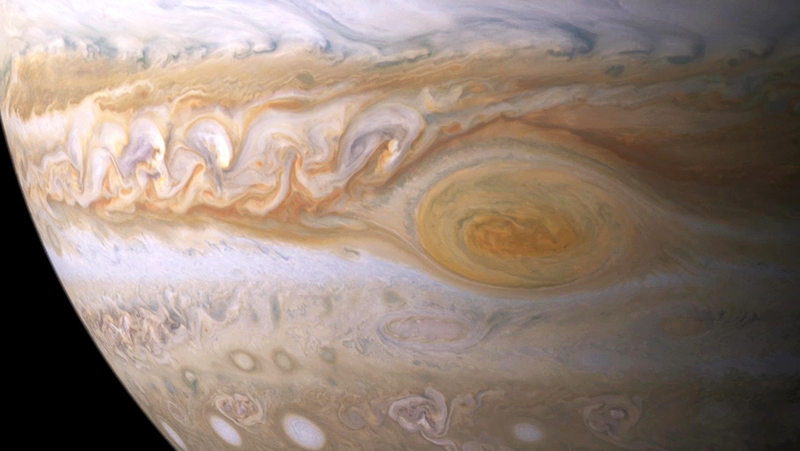 The Great Red Spot is a vast storm about 10,000 miles wide — around 1.5 times the size of Earth. "It's the largest storm in the solar system," says James O'Donoghue, a researcher at Boston University's Center for Space Physics. "I guess, really, it's the largest storm we know about anywhere, so far." This storm has screaming winds that blow up to 350 miles per hour, he says. 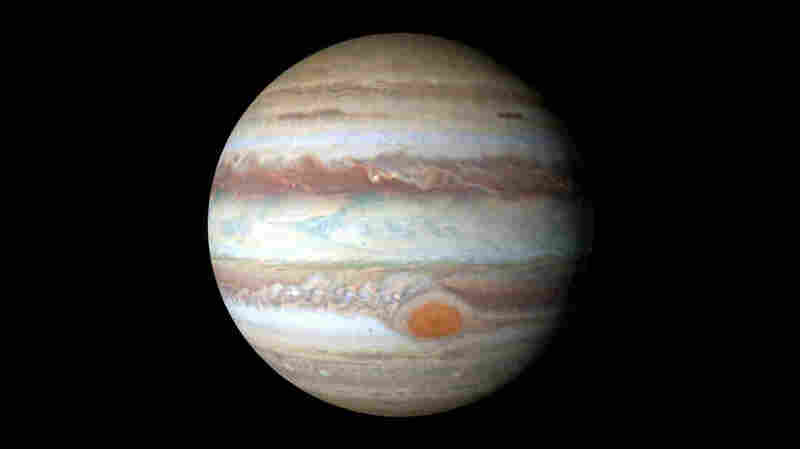 And, while a storm on Earth might last just hours or days, O'Donoghue says, "on Jupiter you have this massive storm that's existed for as long as we can measure it — for over 300 years now." Recently, O'Donoghue realized that the Great Red Spot could help explain a mystery about gas giant planets: Why are their upper atmospheres so darn hot? "Essentially all of the gas giants' upper atmospheres are measured to be several hundred degrees warmer than they should be, based on simulations of heating from the sun," he explains. To try to understand why, he and some colleagues decided to map out the temperatures across the upper atmosphere of Jupiter. And, lo and behold, they discovered a spike in temperature directly above the Great Red Spot. The ongoing storm we call the Great Red Spot rotates counterclockwise, coming full circle every six Earth days. The area above this storm is way hotter than surrounding regions, by about 1,000 degrees Fahrenheit. "So the difference is very large and very real," says O'Donoghue. Here's what he thinks is happening: As the churning clouds and gases swirl and mix, they create a deafening roar. Those sound waves travel hundreds of miles up and crash into particles in the upper atmosphere, agitating them and raising the temperature. "It's kind of like waves crashing on a beach," he says. "Because temperature is only the movement of molecules and ions with each other, bouncing around, the only thing you really need to do is make them move around quicker and collide more with each other." He found it surprising that something so far down in the atmosphere could affect a region so much higher up. "We didn't really expect any interaction between those two regions," he says. The finding is a clue that the extra heat seen in the atmospheres of gas giants could be coming from below. Amy Simon, a planetary scientist at NASA's Goddard Space Flight Center in Maryland who didn't work on this study, says "it's certainly intriguing. I think it's something that warrants a bunch of follow-up." She notes that other things might cause this heating as well, and that scientists really know very little about the Great Red Spot — they're not sure what formed it, why it sticks around, or even why it's red. "We have a guess as to what the clouds are made of, but we don't have direct evidence of that," says Simon. Researchers are likely to learn more about this epic storm from NASA's Juno spacecraft, which will orbit and study Jupiter for nearly two years. Juno just arrived at the gas giant earlier this month. The Great Red Spot looks small from Earth, but Juno will get to see it close-up, so should help pinpoint "exactly where the heat's coming from," O'Donoghue says.